The Swiss take pride in their lush landscapes, and Bollywood buffs know why. The breathtaking alpine pastures of this small mountain country have replaced strife-torn Srinagar and polluted and overpopulated Ooty as a backdrop for frolicking fantasies as our buxom actresses and burly actors join Heidi in yodeling on the hills. Besides reflecting the recent global aspirations of the Indian middle class, Bollywood seems to have cast off Indian landscapes as sullied and unworthy. 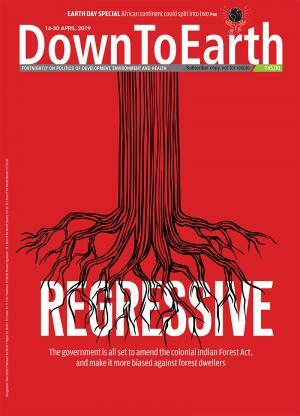 This is not causing sleepless nights at the Indian Ministry of Environment and Forests, whose minstrels would rather keep people out than in their vast domain of ecologically sensitive areas. Indian natural resource managers could do with a lesson on how the Swiss plan to ensure that their landscapes keep the registers ringing with revenue from tourism, and yet conserve their beauty. From mid-May to September every year, tourists in search of peace and beauty head for the short-lived but dramatic annual display of wild flowers in the alpine meadows of Switzerland, where silence is broken only by the occasional tinkling of cowbells. Strictly speaking, the terms 'alpine meadow' or 'alpine pasture' refer only to the region in any mountain range that is just above the natural tree line, and just below the snow line. The 'tree line' is the altitude beyond which trees can no longer grow, because of severe weather conditions. 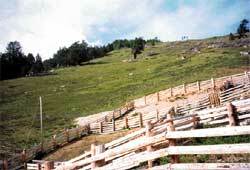 The area is covered in snow for all but six or seven weeks in a year, leaving a very short vegetation period. As a result, beyond this altitude, which for the Swiss Alps could be anywhere between 1700 and 24/2700 metres above sea level (msl), there are only dwarf shrubs and grassland. Battling heavy snowfall, frost and low oxygen and carbon dioxide concentrations gives the plants in this region special characteristics, many having medicinal properties They are more nutritious for wild and domestic animals than lowland plants, which grow slower and hence have a higher fibre content. Most are endemic to high altitude meadows. And most put on a floral display to attract pollinators and complete a cycle of life within short but splendid lives. The mix of highly nutritious grasses and legumes in the alpine regions has attracted graziers to trek up every summer with their cattle for centuries. Because Swiss agriculture is oriented towards livestock production that provides more than two-thirds of the country's agrarian income, these alpine pastures are a very important part of agriculture. Milk is by far the most important product of Swiss farming, and forms the raw material for two famous Swiss exports -- cheese and chocolates. India, too, has an exquisite belt of alpine pastures nestled high in the Himalayas, just above a tree line of roughly 3000 msl. Here too, nomadic pastoralist communities such as the Gaddis and Gujjars have trekked long and arduous routes for years, in search of fodder for their animals. But though both the Swiss and Indian alpine regions have been put to essentially the same use for centuries, the approach in their management today could not differ more. The Swiss emphasise sustainable use of the pastures as the only way to preserve them. In India, emotions are spent by both 'conservationists' who believe the pastures should be declared protected areas and grazing banned, and by those who espouse the cause of traditional grazers. Indian scientists usually choose the safe and trodden path of conservation and advocate bans on grazing, even though few studies have tried to document grazing pressures on the alpine pastures, and possible solutions. Swiss scientists would consider this a lazy approach. A strong philosophy that underlines all work at the Institute of Plant Sciences in Zrich, for instance, is that neither conservation nor agricultural strategies are likely to be sustainable unless comprehensive, ecological, social, economic and political dimensions are taken into account. Scientists at the institute point out that complex situations involving these dimensions require adaptability and responsiveness, and the design of new strategies of grassland management. Switzerland is a federal republic composed of 20 cantons and six half-cantons. These 26 cantons are independent and the federal constitution of 1874 established a strong central government while maintaining large powers of control in each canton. A highly developed federalism leaves many tasks to the local communities, and involves them in governance. Traditionally, for instance, mountain cantons such as Uri have had 'corporations' formed by local people, to look after the management of natural resources such as pastures, water and forests. The country has followed a policy of political neutrality all through the World Wars. "After World War II, the fear of another war drove Switzerland to focus on achieving self-sufficiency in food production," explains Erwin Stucki, a rural economist from the Institut d'economie rurale at Lausanne. "Farmers were assured a good price for their products from the government, even if this meant that the price of food was higher than in neighbouring countries." In the 1970s, the emphasis on self-sufficiency reached economic and ecological limits, according to the Swiss Federal Office of Agriculture. The agricultural produce the State bought from the farmers could only be sold at a loss. Milk processing alone cost the public around us $66 million in 1993, with the total spending on agriculture and food reaching around $2 billion. Natural biological diversity suffered from the focus on production. Also, protectionism became unacceptable under the General Agreement on Tariffs and Trade (gatt), and environmental problems associated with excessive agricultural production became evident. To overcome these problems, in June 1996, the Swiss approved a new constitutional article abandoning the focus on self-sufficiency in food production, and adopting instead the tenets of "multifunctional agriculture". The main functions of the new policy were to secure food supply for the population, conserve natural resources, tend the cultural landscape, and decentralise settlements in the country. To achieve these goals, agricultural prices were left to the free market and subsidies removed, but the 'public service' of farmers, particularly ecological ones, were to be compensated by a system of 'direct payments', rather than subsidies . The Swiss government now pays 'general direct payments' to farmers who, for instance, are livestock farming on difficult terrain. There are also 'ecological direct payments', for which farmers have to follow a set of sustainability guidelines developed by the government and federal research institutions. These include limits on fertiliser use, soil checks, organic farming etc. Swiss farmers receive direct payments to the tune of $1.6 billion annually, out of a total agriculture budget of $2.17 billion. The Swiss government now pays 'general direct payments' to farmers who, for instance, are livestock farming on difficult terrain. There are also 'ecological direct payments', for which farmers have to follow a set of sustainability guidelines developed by the government and federal research institutions. These include limits on fertiliser use, soil checks, organic farming etc. Swiss farmers receive direct payments to the tune of $1.6 billion annually, out of a total agriculture budget of $2.17 billion. Alpine pastures alone cover a fourth of the country's surface area, constituting an important feed basis for livestock-husbandry farms. Besides their function as providers of roughage, natural pastures are seen to play a major role in the landscape of Switzerland. But to those used to the concept of grazing bans and 'permits' for which even the poorest pay to take their cattle to graze in alpine pastures, as is the case in India, it comes as somewhat of a surprise that Swiss farmers are actually paid to take their cattle up to graze in alpine pastures . Every year, the government pays up to $54 million to farmers as an ecological direct payment, to encourage them to make use of their traditional permits and take their cattle to the mountains. The reasons for these, as listed by Thomas Maier from the Swiss Federal Office of Agriculture (soa), are based on the multifunctional approach to agriculture. "As Swiss farmers got wealthier, their incentives for taking cows to graze in summer alpine pastures reduced," says Maier, adding, "This meant that several grazing zones in the mountains were abandoned." The situation presented a problem for several reasons. To begin with, the existing system of fodder production was unsustainable. In many parts of Europe, as in Switzerland, the philosophy then was to grow a few fodder species that were productive and suited to intensive management. Such a system increased milk and meat production and was economically attractive, but created a number of ecological problems. The receding of former permanent grasslands and intensive management greatly reduced biological diversity. Grassland with high levels of Lperenne needed a high rate of nitrogen fertilizer for maximum production and this, in turn, had negative impacts on the environment. Besides, reduced use of mountain pastures meant reduced employment opportunities in the mountain regions, which could result in a migration of population to the plains. Mountain cantons have traditionally held political clout since they number more than lowland cantons. Their economic interests have always been of primary concern in federal policymaking while municipalities have focussed on local planning and implementation. Unlike the Indian situation, where traditional users of alpine resources are pastoral nomadic communities, with little political clout, this has meant that the concerns of mountain farmers cannot be simply ignored. Also, reduced grazing could alter the alpine ecosystem, as cattle play an integral part in 'opening up the landscape' and maintaining biodiversity, says Maier. Reduced grazing had been found to reduce the biodiversity in the region, as sturdier plants, which remained unchecked by grazing, take over the landscape and become 'weeds', not allowing other species to grow. Tourists come to Switzerland to see open grasslands with cows, and grazing was an important factor to attract tourist revenue. There were several Swiss cheese varieties produced with milk from cows grazing in these pastures. A diet of alpine species for cows is important to the taste of these cheeses. Based on these reasons, the question was not whether the pastures should be grazed or not, but rather how they can be grazed in a sustainable manner. Methods for sustainable use of the alpine pastures have been, and are being developed with technical and scientific advice from many institutions. Walter Dietl, a meadow ecologist from the Federal Research Station for Agroecology and Agriculture proposes that alpine farming and utilisation should be planned on the basis of detailed plans showing the land's suitability for specific types of utilisation. Areas favourably situated in fertile locations can form fairly intensively grazed areas, which can be spread with organic manure every year. Less productive pasturage areas with varied flora are used less intensively, and fertilised only rarely. And in locations which are not very productive, an extensive traditional scattered utilisation is best. "As human beings, animals and plants live in the same landscape, any artificial division of the habitat is to be avoided," he says. A graded intensity of utilisation of the meadows leads to a staggered usage of the pastures, leaving lush and high-grow ing meadows available for fauna all year. "In addition, farmers are convinced of their moderate and responsible Alpine cultivation, and do not have to be bound by contracts or statutory regulations," says Dietl. "They are not forced to adopt defensive nature conservation, they put integrated nature conservation into practice," he adds. However, Jacob Troxler, from the Federal Agricultural Research Station Changins in Nyon, is worried that the number of cattle grazing in the Alpine regions will diminish over the coming years, and the risks of grazing zones being abandoned increase. His work focuses on optimal management, where it is possible to maintain an open, well-structured countryside of high ecological value, even with a low density of livestock. According to him, grazing cattle in Alpine pastures is a matter of ensuring good management with the correct stocking rate, and 'rotational grazing'. Under rotational grazing the pasture is divided into a number of paddocks, and the cattle are moved from one paddock to another to ensure that each area is given a chance to recover over the fixed number of days that cattle are allowed to inhabit the alpine pasture. The size of each paddock and the number of days spent by the cattle in each paddock depends on the number of cattle, and the quality and yield of the pasture. Past experience has shown that to integrate the objectives of agriculture and nature conservation, policy targeting is required to ensure cost effectiveness of a sustainable practice. For instance, to ensure that people continue to use the pastures rather than simply use feed concentrate, the price of feed concentrate has been raised. Milk quotas, which restrict the amount of milk each farm can produce, have also ensured that farmers are not encouraged to produce surpluses by using feed concentrates. To discourage loss of employment opportunities in the mountains, farmers in the plains are allowed to sell or rent out their milk quotas to farmers in the hills but the reverse is not allowed. Meanwhile, direct payments come in handy to ensure that the farmers follow the rules of sustainable use while using the pastures. Farmers are allowed to graze only a fixed quota of cows for a fixed number of days every season to qualify for the payment. A central objective of the agricultural reform has also been clear regulation of product labeling, giving the origin and details of the method of production, to increase the value of sustainably produced goods. During the 1970s, when Swiss policy focused almost exclusively on self-sufficiency in food production, imitations of the famous Swiss Emmental cheese appeared in traditional Swiss international markets, harming exports of the original product. At this time, the protection of geographic names was covered under a law on the protection of trademarks and indications of origin. This was not a satisfactory legislation for agricultural products since it did not clearly distinguish between indication of origin and geographical denomination. The law failed to protect Swiss products such as Emmental at the international level, as their origin was simply defined as 'generic' and open to imitation. Legal enforcement was made impossible since no formal register of geographical indications existed under the legislation as record. In July 1992, the European Community (ec) adopted legislation on the denomination of orgin, which gave countries outside the ec an opportunity to have their products protected and patented, provided they already had similar legislation in place. Given that 80 per cent of all Swiss cheese was bound for the ec , the establishment of a legal framework on the denomination of origin became a priority for the soa . A Protected Denomination of Origin and Geographical Indication legislation (pdo - pgi), more popularly known as L'Apellation d'origine contrle (aoc) and L'indication gographiques protge (igp) was drawn up, to protect products with traditional names whose production methods had a link with the region in which they were produced. The legislation came into force in 1997. The first objective of this legislation was the protection of Swiss geographic denominations, in the belief that the name and identity of the products would fetch better prices, from aware consumers who expect quality products, and with guaranteed production methods that are sustainable in the long run. Also, it had a clear socioeconomic impact, fostering and encouraging the manufacture of value-added products in decentralised regions with low economic outputs. One of the first cheese varieties to get aoc certification was L'etivaz, produced in the Pays-d'Enhaut (literally, upper land) area of French-speaking Switzerland. L'etivaz cheese, "impregnanted with the fragrance of alpine flowers", is produced by 70-80 families between May 10 and October 10 every year. In the spring after the snowmelt, all the families who either own alpine pastures or have rights to its use, are expected to contribute to repair old paddocks and prepare the pastures for the season. Once they are ready, the livestock is put in the care of professional cowherds and cheesemakers for the summer, and left to roam an area of more than 6000 hectares of alpine pastures. The Swiss approach in the management of grasslands differs considerably from the one adopted in India. Rather than putting out "keep off the grass" signs and closing off a major part of their country to economic development, the Swiss have chosen to integrate ecological and socio-economic concerns, and ensure that resource-use is not concentrated only in the plains. Indian policymakers have several reasons why they should follow this approach. To begin with, nomadic pastoralism has its roots in sustainable resource use -- the grasslands in the plains are given a chance to regenerate when livestock are taken to graze in summer pastures. Secondly, the Indian government has a hard enough time creating employment opportunities , for it to go about destroying those that already exist on the basis of non-existent proof that these livelihoods harm ecosystems. The paucity of studies on the Himalayan pastures makes it impossible to comment on the impact of grazing in these areas, but the administration has at least one well-documented case where a grazing ban has had a negative impact on an alpine pasture. The Valley of Flowers, a picturesque valley in the inner Zaskar Valley of the Greater Himalayas in the Kumaon region was declared a national park in 1981, and grazing communities who have used the areas for centuries were banned entry. No study was done to monitor the impact of this move on the rich biodiversity of the area, which had survived years of grazing. Nor was there any study that indicated that the grazing was actually harming the ecosystem. Today, the management struggles to control a run away species, Polygonum polystachum , and maintain the diversity of species that once existed there. Park authorities refuse to admit that P polystachum is a 'weed', and a threat to the diversity in the area. But according to a rare doctoral thesis on the region that was submitted to the University of Delhi by Anupam Joshi, P polystachum colonizes resource rich habitats that result from litter accumulation in the absence of grazing, and replaces other species through competition. Joshi concludes that unless some amount of grazing is allowed, P polystachum will most likely increase further and replace other plants in the region. Another study has documented that the biodiversity in the valley has decreased due to the dominance of Polygonum in some parts. Even scientists at the Wildlife Insititute of India have pointed out that Polygonum has affected the value of the Park as recreational resource. Despite this evidence, Indian policy makers, scientists and conservationists have not even started to debate whether an alternate strategy may be more successful, and that a conservationist philosophy may not be the most productive approach to grassland management.